This time of year, social calendars are filled with potlucks, picnics, and many other occasions where friends and family gather to have fun and eat awesome picnic-style food while enjoying the longer days and warmer weather. This amazing recipe for Instant Pot Heirloom Potato Salad is the perfectly easy and delicious, and just may become your go-to dish to bring along as your food offering. It’s so easy! Let’s be honest, everyone wants to be out playing this time of year, not cooking. 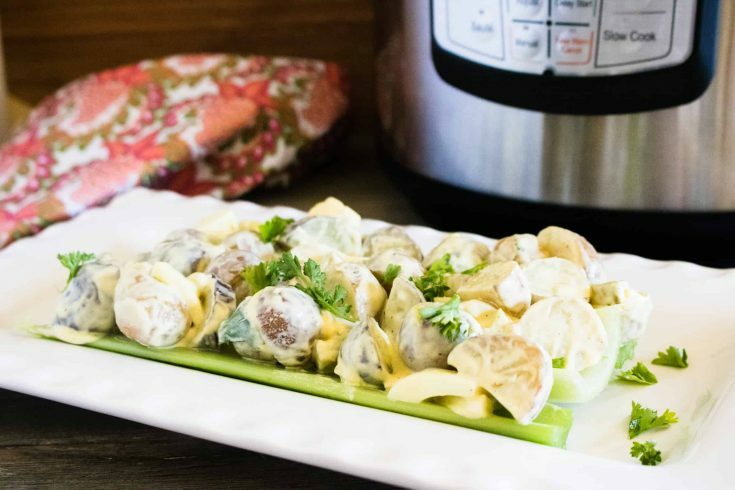 The use of the Instant Pot for this Instant Pot Heirloom Potato Salad speeds up the usual potato salad making process by quite a bit. Add your potatoes and eggs in the shell to the Instant Pot and be amazed when both are done in just 10 minutes. And with a little chopping, measuring and mixing it is ready to enjoy! Heirloom potatoes are so pretty and interesting. Did you know that heirloom means these potatoes are grown from seeds passed down from generation to generation? Pretty amazing, right? What’s even more awesome is that these seeds are pollinated naturally by insects or wind. Cooking and eating them almost makes you feel like a pioneer. Oh, and of course, they taste delicious and often boast beautiful and varied coloring. 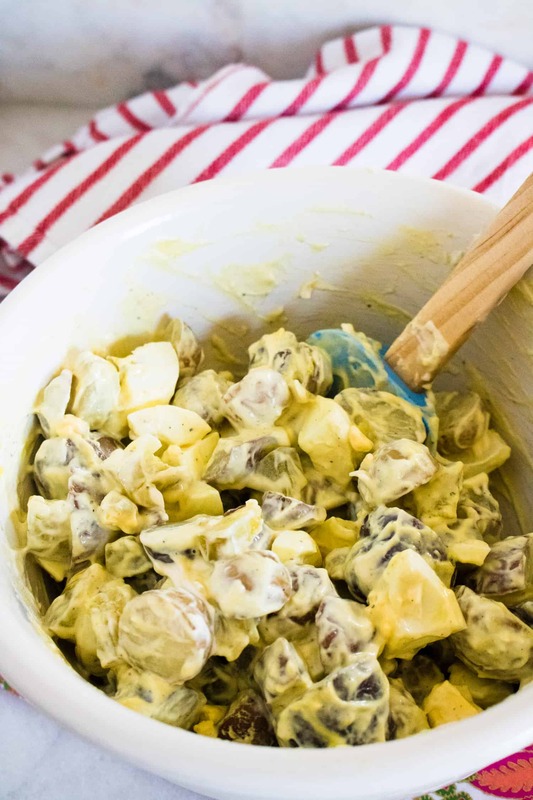 Potato salad is perfect for summer. Tasty and traditional potato salad with mayo, mustard and pickles is a quintessential summertime staple. 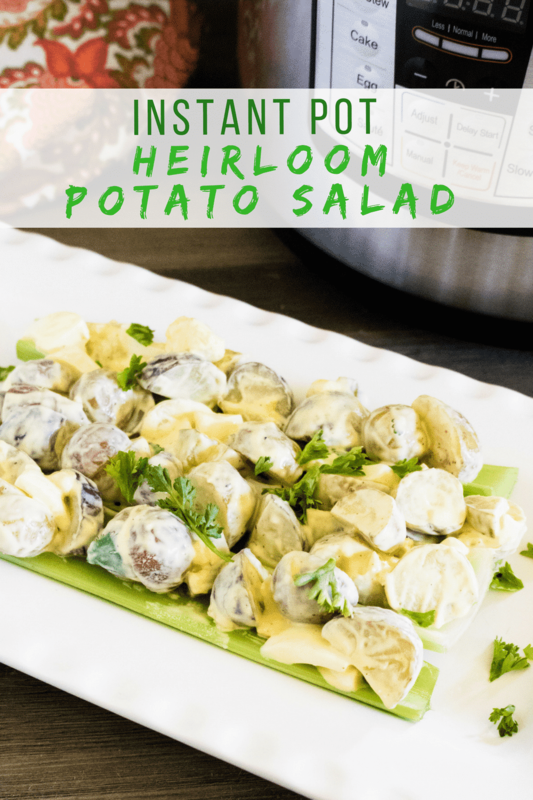 Which means this Instant Pot Heirloom Potato Salad recipe is sure to please any crowd! Delicious BLT Pasta Salad is amazing! Everyone loves BLTs. Just imagine it with pasta instead of bread. Yum! Or, how about bringing a sweet treat to your next event? 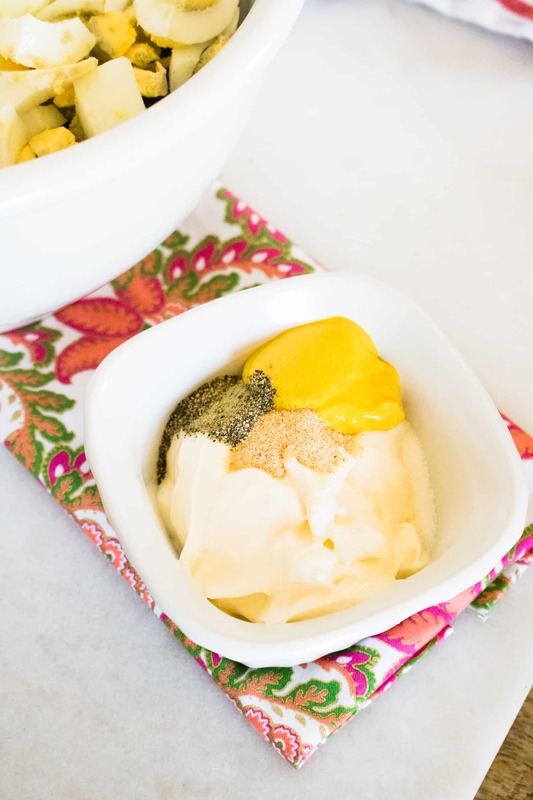 This Orange Fluff Salad is cool, delicious and packed with bright and sunny orange flavor. For those following the Keto diet, or any low-carb eating plan, Broccoli Keto Slaw is a delicious way to enjoy the great tastes of summer without compromising your healthy eating program. Add 1 cup of water to the Instant Pot inner pot. Place potatoes and eggs in a steamer basket or on top of trivet inside the Instant Pot, making sure they stay out of the water. Then close the lid and turn the valve to sealing position. Set to a manual high pressure time of 5 minutes. When the cooking time has finished, perform a natural pressure release. Next, remove the eggs and potatoes from the Instant Pot. Put eggs in a bowl with cold water and ice to stop the cooking process and then remove the shells. Refrigerate eggs and potatoes until cool. Chop up the eggs and pickles, and then add to a bowl along with the potatoes. Mix mayo, mustard, and seasonings in a small bowl and then add them to the potatoes. Stir all ingredients together and either refrigerate for a couple hours, or serve immediately. Add potatoes and eggs to a steamer basket or on top of trivet but out of the water, in the Instant Pot. Set to a manual high time for 5 minutes. When the cooking time has finished, do a natural pressure release for 5 minutes. Remove the eggs and potatoes from the Instant Pot. Put eggs in a bowl with cold water and ice to stop the cooking process and then remove the shells. Refrigerate eggs and potatoes until cool. 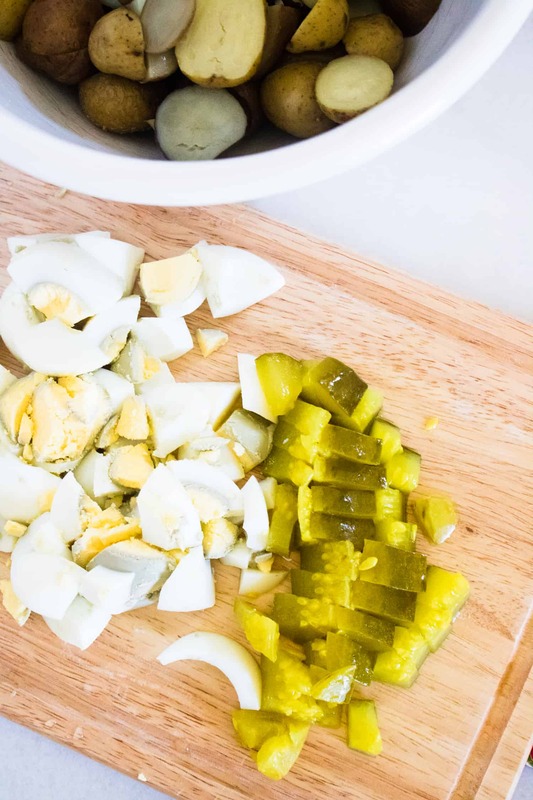 Chop up the eggs and pickles. Add to a bowl with the potatoes. Stir all ingredients together and then refrigerate for a couple hours or serve immediately.